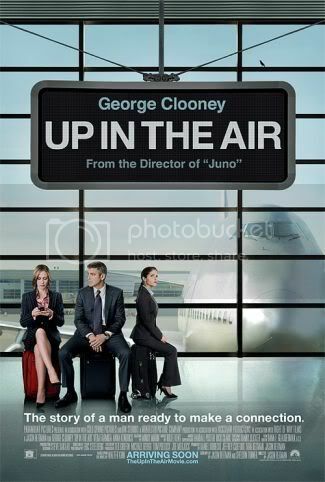 Jason Reitman hasn’t been making feature length films for very long; in fact, Up in the Air is only his third. His previous efforts have been critically acclaimed, both Thank You for Smoking and Juno [review here]. With Up in the Air Reitman has set himself a new standard. The story and characters are unique, yet relatable. 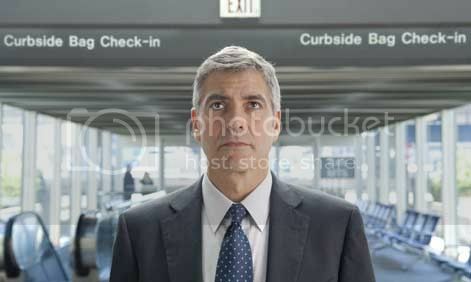 George Clooney is Ryan Bingham, playing one of his most nuanced roles yet. Some people might describe Bingham as a narcissist and a jerk, but he merely lives by his own life philosophy. He does his job, and travels, and that is all. His company gets hired by employers to make layoffs: having an unfamiliar face do the firing allows bosses to be wimps and reduces the amount of physical damage a newly terminated person might wreak. Bingham’s position requires that he travel 310 days a year, leaving him 40-odd miserable days to spend at home. His true home is the sky, and the hotels, and the rental cars. He lives out of his suitcase, and he loves it. His only true goal in life is to rack up a certain number of miles, the exact target of which he keeps a secret for much of the film. He is not a sadist, however. He does not enjoy being the harbinger of pain for people, ruining their lives in a single day. He approaches his work as humanely as possible, while still recognizing that he has a job to do. His personal life is a mess. He hasn’t seen his family in years, though they are the domesticated type and call him occasionally. His only romance revolves around one-night layovers. In an airport bar he picks up an attractive road-warrior by the name of Alex (Vera Farmiga). Their brief mating ritual, involving impressing the other person with how many cards and levels of access they have to various hotels and airlines, is one of the movie’s most hilarious scenes. They speak a language that would be foreign to all but the most seasoned travelers. After an initial fling they discover that they actually like each other, and look at their calendars to discern when they will next both be in the same city. In this manner their impossible, fantastical “relationship” continues. Meanwhile, things are changing at Ryan’s workplace. His boss (Jason Bateman) has heeded the advice of a young go-getter by the name of Natalie (Anna Kendrick, whom you may remember from Rocket Science. Oh, and perhaps the Twilight movies). Natalie has suggested cutting costs drastically by performing layoffs via video conference, an idea that leaves Bingham appalled. Bingham is worried that because the young Natalie has no experience with actually terminating people, she has no idea what she’s talking about. He is also scared of losing his home and the freedom of his travel. Their boss suggests that he train her on his next run, an assignment that he grudgingly accepts. As they embark on their journey he teaches her the tricks of the trade, not only in how to terminate employees, but also how to travel quickly and painlessly. I loved this movie. As mentioned above, it is a unique story, with characters we care about. My brief time in the business world allowed me to appreciate the insanity of what Bingham does and how much he loses touch with humanity by doing it. Through his relationships with Alex and Natalie he learns things about his life. There is no single cathartic moment, however. The change is gradual and subtle, and Ryan doesn’t become an entirely new person at the end of the film. That’s what I liked most about the movie. It is an honest look at the lives of these people, who may actually exist. There is no formula that the film follows to arrive at its conclusion: things happen that I did not expect, and things don’t happen that I expected would occur. The entire time the movie does not hit a single note falsely. The performances of the actors are a large reason why. Clooney is fantastic at playing the aging loner with a unique view on life. Farmiga is a fun-loving career woman, out to have fun where she can make time for the requisite layover. Kendrick perhaps has the most difficult job, playing a naïve girl experiencing the harsh reality of the corporate world for the first time. I laughed a lot during the first half of the film. The gentle shift to more serious themes and events seems perfectly natural for the movie, and I was totally engaged the entire time. The directing is superb, with Reitman showing that he can still make a good film without relying on the quirky stylishness necessary to make a film like Juno succeed. Up in the Air is the best movie I’ve seen this year and I will be excited to see what such a young, talented director has in store for the years to come. This entry was posted in 3 pirate flags, 4 stars, Movie Reviews, U on January 8, 2010 by Tim Irwin. Stands -back -from -the -keyboard -in -amnemzeat! -Thanks! Estoy -tan -emocionada -de -poder -participar -en -esta -construcci+AMMAsw-n -de -conocimientos, -pero -sobre -todo -saber -que -habemos -tantas -personas -comprometidas -en -esta -noble -MISION: -Educar. -Espero -que -con -mi -inscripci+AMMAsw-n, -pueda -participar -los -dos -d+AMMArQ-as. -Agradezco -sus -atenciones -y -muchas -bendiciones -para -estas -propuestas -de -cambio. -Nos -urge -intercambiar -esperiencias -exitosas -que -nos -animen -en -este -momento -hist+AMMAsw-rico -tan -desconcertante…..
Way -to -use -the -internet -to -help -people -solve -problems!